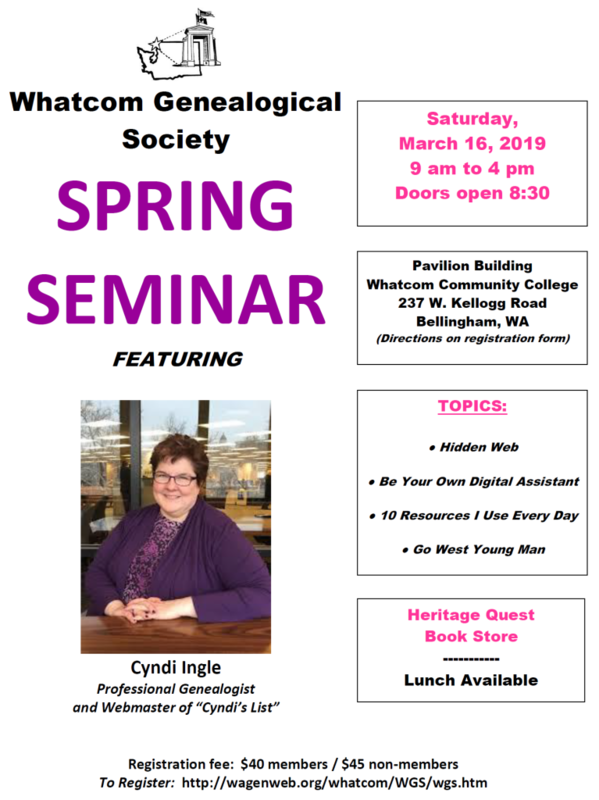 Despite the fact that we have a registration deadline of February 25th on our Whatcom Genealogical Society Spring Seminar Registration form, there is still some leeway in that respect. We know you won’t want to miss seeing Cyndi Ingle for an educational and fun experience. We look forward to seeing you there! WHATCOM GENEALOGICAL SOCIETY TO CELEBRATE 50th ANNIVERSARY! Whatcom Genealogical Society will celebrate its 50th Anniversary on Monday, Feb. 11th from 2 – 4 pm at the Bellingham Elks Lodge, 710 Samish Way, Bellingham, WA. Our speaker will be Jeff Jewell, Photo Archivist at the Whatcom Museum. Visitors welcome! For information: 360-733-8300. Whatcom Genealogical Society will meet Monday, November 12, 2 p.m. at the Bellingham Elks Lodge, Bellingham. 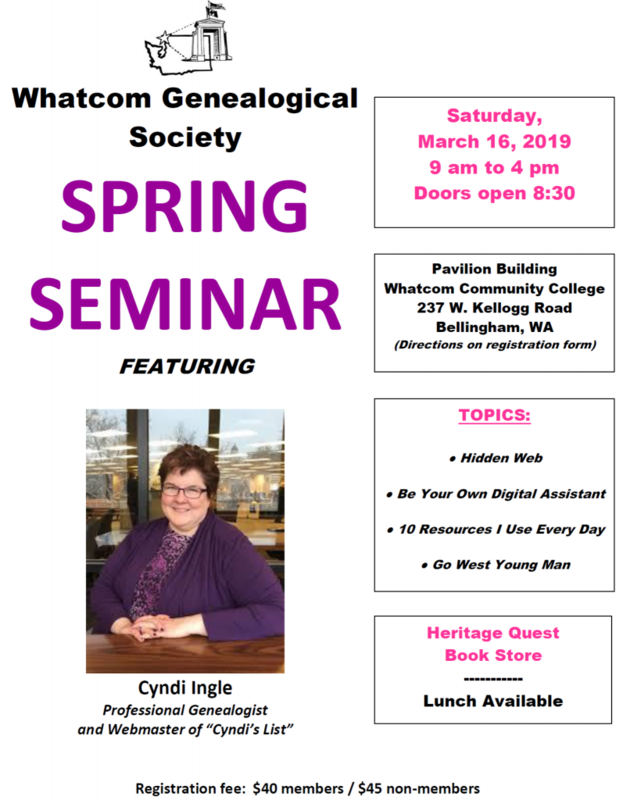 The program will be Elizabeeth Joffrion from WWU Center for Pacific Northwest Studies and Jannette Gomes from the Washington State Archives who will give a presentation on what is available for genealogists at their facilities. Visitors are always welcome! Contact: 360-733-8300. Whatcom Genealogical Society Meeting Monday, October 8, 2:00 pm Bellingham Elks Lodge, 710 Samish Way. Evelyn Roehl of Kin Hunters will give a presentation on German research. Visitors Welcome! 360-966-3860 for more info.